Enhance your vegetarian menu with this delicious appetiser recipe. The vegetarian teriyaki skewer with crispy rice and glazed oriental vegetables are easy to prepare and have the authentic taste thanks to KNORR Professional Teriyaki Paste. Wash the rice in a sieve until the water runs clear. In a suitable pan place the sushi rice and measured water. Bring to the boil and place a lid on the pan, simmer for 8-10 min. until the water has evaporated. Take off the heat and set aside for 20 min. to cool and finish cooking. With wet hands roll the rice into twenty tight balls, allow to chill in the fridge. Soak twenty wooden skewers in water to prevent the skewers burning. Cut the spring onions in half (widthways), cut the Aubergine into 2cm. Dice and remove the storks from the mushrooms. Preheat an oven to 190°C. 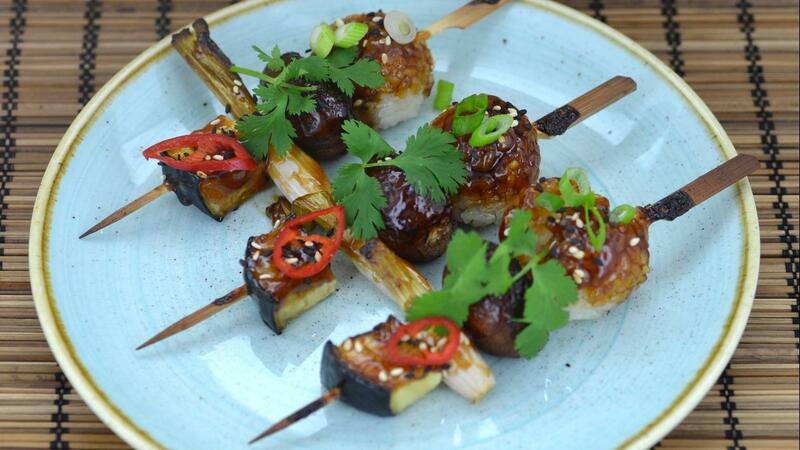 For each skewer; skewer one rice ball, one chestnut mushroom, one half spring onion and one aubergine dice. Repeat this until you have twenty skewers, allowing two per person. Place the skewers on a lined gastronome tray and brush the vegetables and rice with the vegetable oil. Cook in a preheated oven for 10 min. until the vegetables are cooked and golden. Make the teriyaki glaze by placing the KNORR Teriyaki Paste, water and mirin in a suitable pan and bring to a boil and whisking to ensure the ingredients are well incorporated. After the skewers have been cooked for 10 min., brush the teriyaki glaze over the skewered ingredients and return to the oven for a further five min. Garnish with sesame seeds, coriander sprigs and sliced chilli.